This post is sponsored by Lipton. I'm always looking for fresh and unique ways to incorporate my favorite flavors into new dishes, be it to share with you, or entertaining friends and family. So, when Lipton Iced Tea challenged me to to reinvent some of my favorite recipes with their iced tea in mind, I was immediately up to the challenge. Since we're currently on vacation in Sapphire, North Carolina, I wanted to pick a tea that fit perfectly with the setting so I landed on Lipton Peach flavor Iced Tea. It's sweet, with a touch of flavor and reminds me of growing up with my mom making Lipton sun tea in the kitchen window with an array of fresh fruits for flavor. Initially I only intended on using a few peaches for my 'peach tea inspired' brunch but after finding a giant 25lb. basket of peaches at the local farmer's market in Cashiers, my head exploded with the possibilities. I was determined to create 4 peach dishes with a twist ranging from sweet to savory, and somewhere in between. If you're a peach lover, these recipes will make you weak in the knees and send you straight to the nearest store to stock up. Naturally, each recipe pairs perfectly with Lipton Peach flavor Iced Tea. Now, these aren't your typical peach pie and peach crepe dishes. Each one is derived from one of my favorite recipes at home and reinvented for the occasion. Because everyone loves a Caprese salad I chose to swap out the tomatoes for fresh, sliced peaches to make a salad with a summer twist. I honestly had no idea it would be so good. I'm tempted to replace the tomatoes indefinitely. Second, no brunch is complete without some of sort of toast. While peach and avocado toast would have been amazing the selection in the area wasn't up to my standards, so I quickly moved on to something with a little more spice. A classic english muffin with a raspberry jam topped with a fiery piece of pepperjack and grilled peach was an unexpected but delicious addition to the table. It sounds, and maybe looks, crazy but the flavors together are surprisingly incredible. This might just be my new breakfast go-to. For the main course, Peach and Balsamic Chicken was the only way to go. I wanted something savory but still with peach undertones. The sauteed garlic paired with the peach balsamic reduction worked together flawlessly. 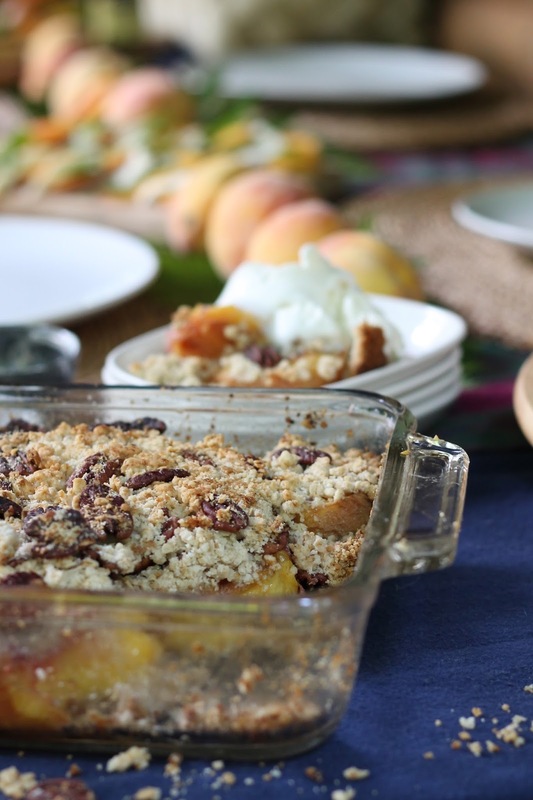 As for dessert, a peach crisp was in order. I took my grandmother's recipe and spiced up the flavor by drizzling the peaches with Frangelico instead of vanilla extract. It gave the peaches and crisp an extra burst of flavor that I didn't think was possible. It's safe to say this was the first thing to disappear completely from the table. I set the table with rustic pieces that I found around the cabin and in the yard. I immediately fell in love with the plaid picnic blanket and rattan place mats for the outdoor setting. Wooden serveware, an abundance of peaches for decor and pops of foliage tied it all together. The Lipton Peach flavor Iced Tea was front and center, each glass garnished with a fresh slice of these juicy drops of sun. 1. On a large plate or dish arrange peach slices, mozzarella and basil in a line. Peach, Mozzarella Slice, Basil. Repeat. 2. Drizzle with Olive Oil and Balsamic. 1. Toast english muffins (or fresh bread) until lightly crisp. 2. Spread raspberry jam on each half and top with a slice of pepperjack cheese. 3. Add sliced grilled peaches and place each half on a greased cookie sheet. 4. Bake for 4-5 minutes, or until cheese is melted, on 400˚. 5. Serve warm and top with fresh basil. 1/4 Cup fresh basil, torn. 1. In a large pan, heat olive oil over medium heat. Add chicken breasts and sprinkle with cracked pepper and salt, to taste. Brown on each side (until fully cooked) and set chicken aside. 2. In the pan with remaining olive oil, add garlic cloves and saute for about 1-2 minutes on medium. Add peaches and basil reduce heat to medium low, cook for about 3 minutes until slightly softened. 3. Add balsamic vinegar. Return chicken to pan and thoroughly coat in Balsamic Peach reduction. 1. In a greased dish, place the peaches halved side up. Pour Frangelico over the halves and set aside. 2. In a medium sized bowl combine flour, oatmeal, sugar and softened butter. Mix until texture is crumbly. 3. Sprinkle over peaches and top with pecans. Bake for 20-25 minutes or until golden brown.